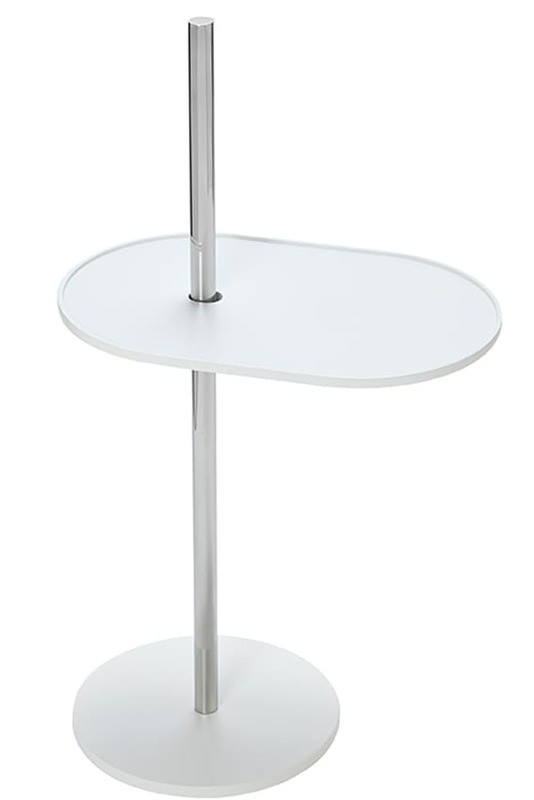 Height-adjustable side table with rotatable shelf. OLIVO is a multi-talented side table. Infinitely height-adjustable, cantilevered top can be rotated, mobile. If an upper part of the upright guide tube remains above the tableau, the result is a practical carrying handle. OLIVO can thus be an all-round companion in the living ambience. The height can be perfectly adjusted at any place by slightly tilting the table top. The additional rotatability of the tableau is a real advantage with different seat formations. Sofa! Bed! Bathtub? Office! The magically simple, patented mechanism is the result of an elaborate development. Molded silicone parts reminiscent of bicycle brakes and a leaf spring ensure precise clamping of the tabletop on the guide tube. The restrained design ensures that OLIVO blends harmoniously into the most diverse living contexts. The award-winning designers Hauke Murken and Sven Hansen once again demonstrate their penchant for functional design with this product. Do you have a question about "Olivo"? How can we contact you?